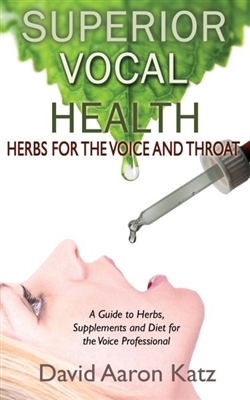 What drugs negatively affect the voice and natural alternatives to those drugs. Foods to eat that affect the voice and vocal mechanism. Sinus Care with cleansing guide and herbs. Food lists that help create and maintain Superior Vocal health. What to do When" natural solutions for the most pressing Performance and Presentation issues such as performance anxiety, clogged sinuses, chest congestion, mental clarity and more. David Aaron Katz is a Professional Opera Singer, Cantor, Nutritional Consultant, Herbalist and CEO of Superior Vocal Health. His life mission is to help Voice Professionals from around the world to learn how to heal, maintain and strengthen their voices naturally without chemical or drugs.